Each player draws one card from the deck. This is the player's hand, and is kept secret from the others. Whoever was most recently on a date goes first (if tied, the younger player wins the tie). In the wake of the arrest of Queen Marianna for high treason, none was more heartbroken than her daughter, Princess Annette. Suitors throughout the City-State of Tempest sought to ease Annette's sorrow by courting her to bring some joy into her life. You are one of these suitors, trying to get your love letter to the princess. Unfortunately, she has locked herself in the palace, so you must rely on intermediaries to carry your message. During the game, you hold one secret card in your hand. This is who currently carries your message of love for the princess. Make sure that the person closest to the princess holds your love letter at the end of the day, so it reaches her first! 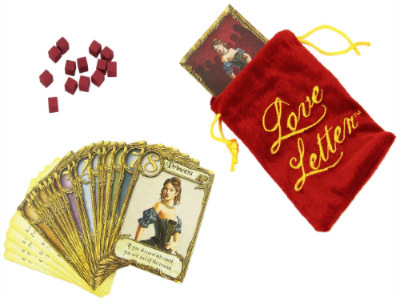 Love Letter is played in a series of rounds. Each round represents one day. 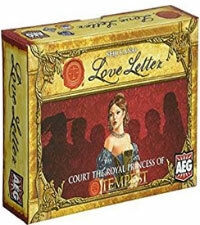 At the end of each round, one player's letter reaches Princess Annette, and she reads it. 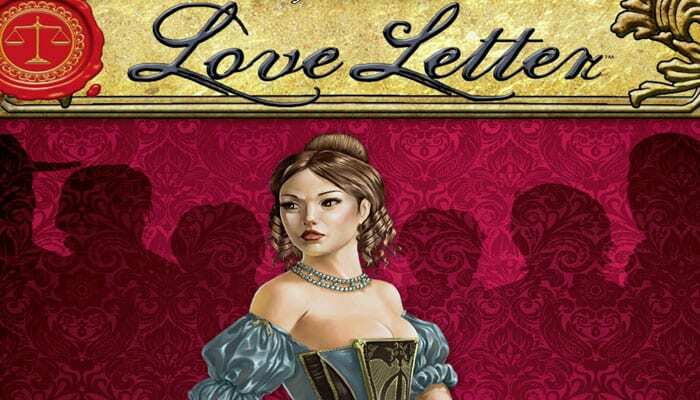 When she reads enough letters from one suitor, she becomes enamored and grants that suitor permission to court her. That player wins the princess's heart and the game. All discarded cards remain in front of the player who discarded them. Overlap the cards so that it's clear in which order they were discarded. This helps players to figure out which cards other players might be holding. 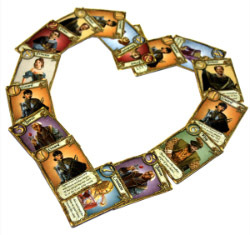 A player could cheat when chosen with the Guard, or fail to discard the Countess when that player has the King or Prince in hand. We suggest that you don't play with knaves who cheat at fun, light games. A round ends if the deck is empty at the end of a turn. The royal residence closes for the evening, the person closest to the princess delivers the love letter, and Princess Annette retires to her chambers to read it. The winner receives a token of affection. Shuffle all 16 cards together, and play a new round following all of the setup rules. The winner of the previous round goes first, because the princess speaks kindly of him or her at breakfast.